The Nick Foles “magic carpet ride” continued last Sunday, and while Foles did not match his record breaking performance from the previous week, he still went 12 for 18 on the day and threw three touchdown passes, as the Birds defeated the Aaron Rodgers-less Packers, 27-13. On the season, Foles now has 16 touchdowns without an interception, which is tied for 2nd in NFL history when it comes to touchdowns thrown to start a season without throwing an interception (some guy named Milt Plum did it back in 1960) and only four behind Peyton Manning’s record of 20, accomplished last season. But while Foles’ numbers have been eye-popping, Eagles fans still have their doubts as to whether he is the answer and the future at quarterback. It’s almost as if we are waiting for the day when he comes crashing back to earth and has a serious of awful games similar to the Cowboys game at home. 1. Michael Vick dazzled us for 11 games in 2010 until he came back down to earth for good. 2. Donovan McNabb, while the best quarterback in modern Eagles history, generally fell short in conference championships and his one Super Bowl appearance. 3. Bobby Hoying had three gangbuster games to start his NFL career in 1997 before he became just an “average Joe” and disappeared into the crowd of working stiffs. 4. Randall Cunningham was a human highlight reel, but looked like Clark Kent in the playoffs, going 1-4 during his time with the Eagles. 5. Ron Jaworski, while a solid NFL quarterback with the Birds, chose Super Bowl XV against the Raiders to have one of his worst games, much to the delight of Raiders linebacker Rod Martin. The quarterback in Philadelphia is like the woman whom you get a great vibe from when you’re being aloof. But start showing interest in her and boom…you’ve got no shot. So perhaps that’s it…perhaps, as Eagles fans, we find it hard to trust, to BELIEVE, that maybe, just maybe, Nick Foles is not just another quarterback riding the magic chariot before the stroke of midnight arrives, and he turns into a pumpkin (a.k.a clipboard holding backup). Perhaps the thought of having a mid to late round draft pick who becomes the next Russell Wilson or even the next (gulp) Tom Brady is something that we feel is never meant to happen in Philadelphia? Perhaps it’s our recent sports history that creates a lack of confidence in our teams? We are usually the ones that give up on talent in error or can’t seem to get the lucky lottery pick. There’s Nic Vucevic’s success with the Orlando Magic, the inability of the Flyers to draft Patrick Kane, or giving up on young players such as JVR, Jeff Carter or Mike Richards (in hindsight too early). Surely, if anyone can screw it up, it’s our “four for four”( to borrow an Anthony Gargano phrase) sports teams right?? Being sandwiched between New York and DC, we as Philadelphians already have an inferiority complex. But add to that only one championship in a span of thirty years, while the New Englanders and their clam “chowda” have celebrated eight just in this decade doesn’t help matters any. But maybe this time will be different. Just as the curse of Billy Penn was broken in 2008 because of a six-week magic carpet ride by the Fightin’ Phils, perhaps Nick Foles will turn out to be a real “franchise” quarterback, and not just a quarterback who advertises for a franchise on Broad Street but can’t bring a parade down it. But first things first, there is still the matter of the “elephant in the room” known as the Eagles losing streak at home, which must be overcome. 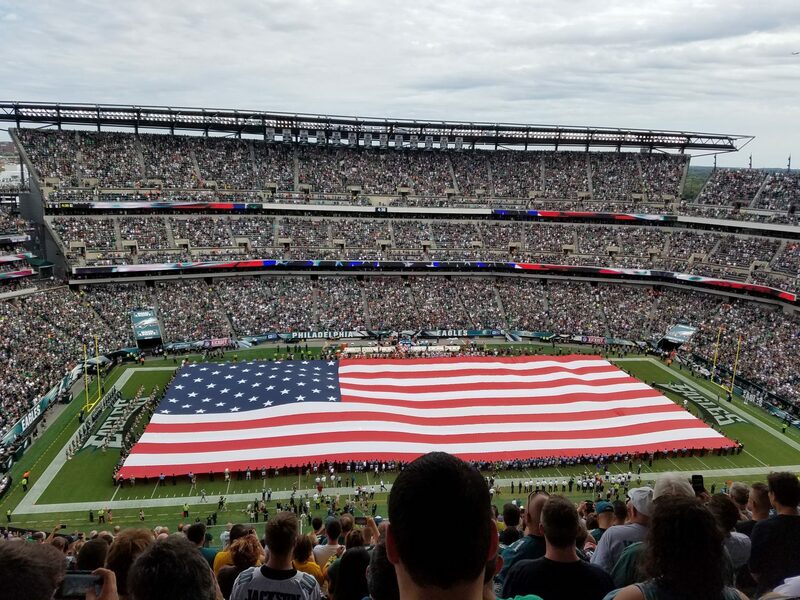 The Redskins come into Lincoln Financial Field this weekend at 3-6, which was exactly their record last year at this point before they ran off seven straight victories and won the NFC East (ironically, they started that streak by beating the Eagles at home). Robert Griffin (RG3) is healthier than he was in the Monday night opener, but the Eagles defense is also an improved bunch from that first game as well. Chiefs at Broncos 8:30 PM NBC – “Whoa Nelly…this one’s gonna be a dandy” (as former ABC college football announcer Keith Jackson used to say) as this game features two teams with a combined record of 17-1. But while the Chiefs, at 9-0, are the only remaining undefeated team left, truth is, they haven’t beaten a single team with a winning record. This game will be a good benchmark for “Big Red” and his squad, not only because of the quality of the opponent, but because of 80,000 screaming Broncos fans in the light air of Mile High. Patriots at Panthers 8:40 PM ESPN – What looked like a “dud” a few weeks back is now a Monday night marquee matchup, featuring the Panthers defense against a potent Patriots offense. Anyone know the over/under on compliments that Jon Gruden will throw out to both teams? The Last Word – They needed to go shopping for a monster at the plate and a cheetah on the basepaths. Instead, the Phils brought home an aging Byrd?? ?